It wasn’t until Star Trek: The Next Generation, though, when they introduced the replicator. On the show, the replicator could be used to produce any material or object, so long as the pattern existed on file. So, Captain Picard could walk up and request “Tea, Earl Grey, Hot” and the tea along with the cup would magically appear. We’re nowhere near that kind of technology today, but the 20th century is filled with examples of science fiction serving as fodder to help foster new ideas. The flip phone cellphone looked like it did because they modeled it after the communicator from Star Trek. Actual physicists and engineers will talk about things like Warp Drives and tractor beams which don’t exist, but they wonder if they could some day. 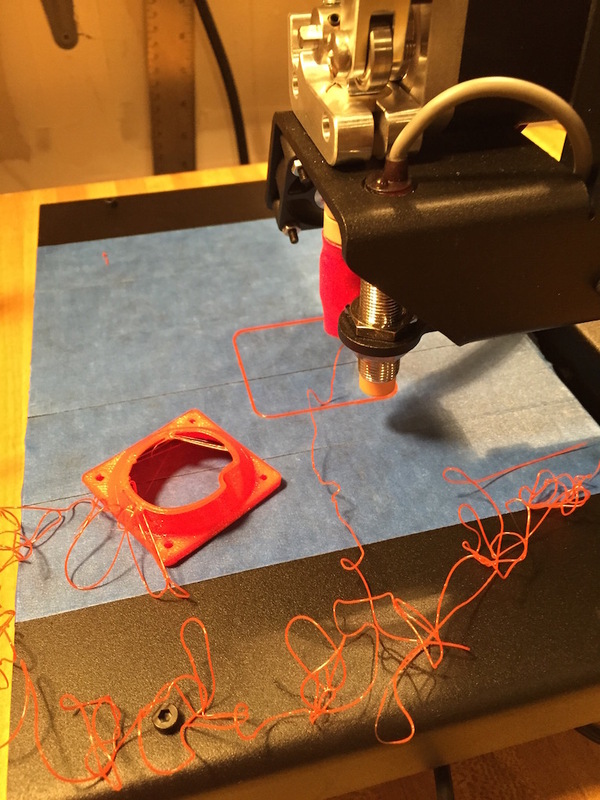 3D printers have been around awhile, but much like the PC in the early 80s, mass production and the reduction in cost of technology have caused the price to drop enough that the current state of the technology is increasingly accessible to the average person. It’s not sufficiently advanced for it to be interesting or useful to most folks, but for the tinkerers and the dreamers, it’s enough to make it interesting! Most consumer grade printers available today print using a couple of variations of plastics, PLA and ABS. One is corn-based and the other is petroleum based. The current generation have the ability to take in this plastic material, run it through a hot tip and extrude it in 3d space for a given X,Y,Z coordinate in the build space of the printer. Typically, the technology uses a layered approach and prints the base of the object then prints layers upon very narrow layers until the object is eventually finished. I think it looks a bit as though a hot glue gun were married to a computer which could think in three dimensions. 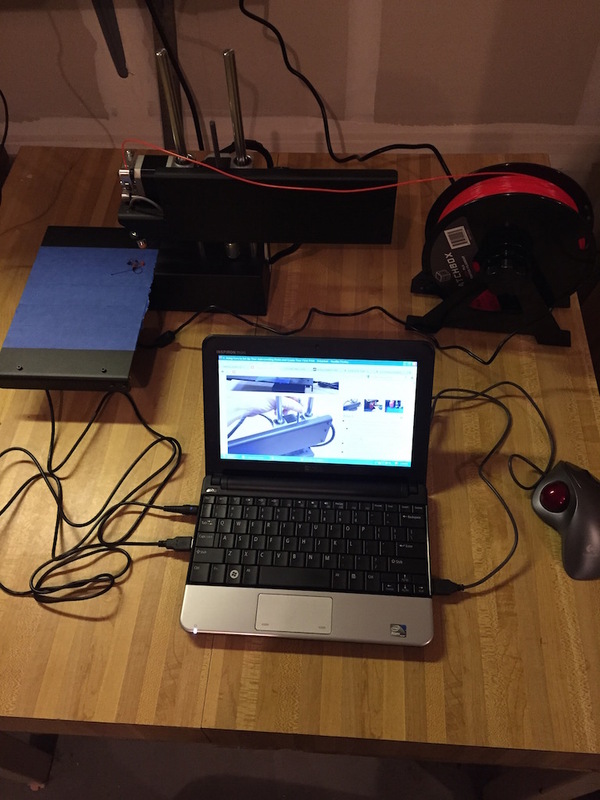 I purchased a Printrbot Simple Metal after watching the technology for the last few years. I’ve been reading yearly reviews that Make Magazine produces yearly, watching the price come down as the quality increases. I chose this model because it was a reasonable trade-off between price and quality as well as openness of the technology. This particular model is modifiable to accept either PLA or ABS materials as well as others that are based on this basic technology. They also didn’t lock in the consumer to only use their branded materials as some others have done, following the printer approach of using DRM so that you can only a manufacturers materials with their printer. This particular printer has a build volume of 6” cubed, which is mid-range for consumer printers. I can also mod the printer to handle up to a 10” cubed volume for a reasonable cost, but for now that’s sufficient. Here’s my setup in my garage for the 3d printer. I have it in the garage because of both noise and the smell. My wife, though very understanding, is likely to respond poorly to the smell of melting plastics permeating the house. The noise isn’t bad, but it’s not silent by any stretch. The first thing I was directed to do was print several small boxes. This is to allow me to dial in the printer accurately. This went fine and I adjusted the printer accordingly once I figured out the right settings. Next I wanted to print a shroud for the fan which blows air on to the extruder. The shroud would focus the air flow and is supposed to result in more consistent quality. In the next pic you can see the results of my first attempt to print the shroud. As you can see, it did not go well. The blue tape on the bed of the printer is simply blue painters tape. It gives a reasonably grippy surface for the print, but it’s not infallible. In this case, I printed on the same tape that I’d used to calibrate earlier and it appears that the shroud came loose from the build plate. Of course, the printer doesn’t know that, so it merrily goes about printing the remainder of the shroud, not realizing it’s gone from printing usefully to making modern string art. LESSON 2 Print times are larger than any rational person would like. The shroud took something like an hour, so I lost time when the first build failed and more time and materials to print it again. But, the printer is in the garage, so if the print fails, I won’t know till I go check, which I did roughly every 20 minutes. And, all I can do once it does fail is cancel the print and clean up the mess and decide whether I’ll try again. Here is a pic of the results of my first nights attempts. 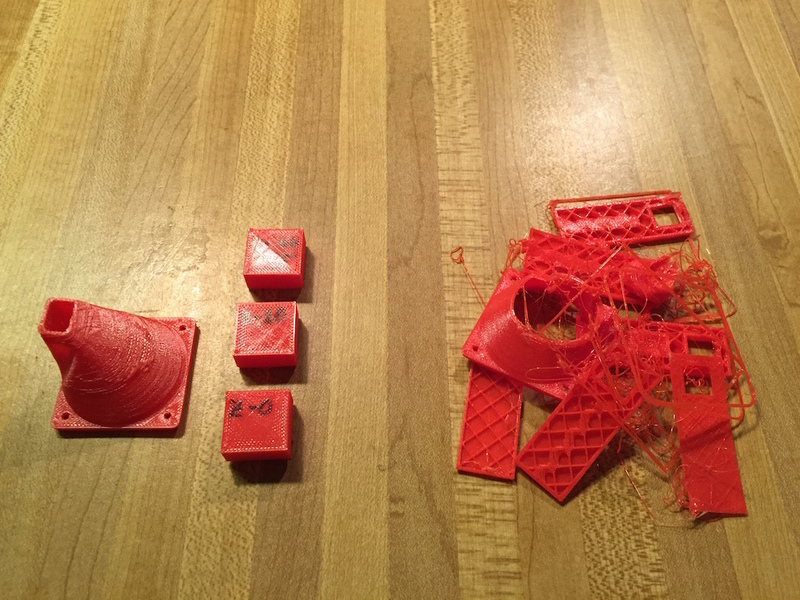 As you can see, the pile of the left represents the successful prints. The pile on the right are the failed prints. Those piles are roughly 50/50, meaning my confidence in doing anything more complicated is not high at this time. 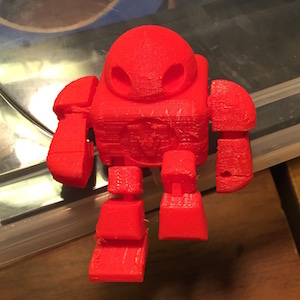 I did try to print a little robot which has moveable joints, mostly in the legs, shoulder and neck. Sadly, my success with the printable joints was also about 50% and it took two tries to get him to print. LESSON 3 Start reducing the number of variables to increase the odds of success. Right now I basically try and print and see how it goes. Roughly half the time it works and half the time something goes wrong with the print coming loose or messing up in some number of ways. I need to figure out why they’re messing up and what knobs and levers I have access to to make it more predictable. There are a plethora of configuration options in the software that controls the printer. Right now I’m using a basic setup and haven’t yet dug deep in to those other options. Additionally, I suspect I’ll want to try with the other main material, ABS. That means an upgrade to my machine to add a heated bed and perhaps a new extruder. The PLA is very rigid and not very forgiving and I believe I may get better accuracy and results with ABS. Additionally, you can get different effects from ABS because you can sand it and even dip it in solutions to get a smoother finish, options that don’t exist for PLA. That means this next phase is about trying to understand how to get the most out of this printer. I can’t treat it like a paper printer and hit Print and walk away. The technology is just not there, yet. It’s a fair question to ask: What are the requirements for people to start buying these in volume for their homes? Because my crystal ball is terrible, I don’t yet know what the parallel would be for 3d printers. Also, the technology needs to be much more reliable. My first computer, a Commodore PET, was built out of sheet metal steel and the body could be lifted like the hood of a car and it even had a steel rod to hold the upper half up. This was necessary, at least in part, because I occasionally had to reach in to the guts of my computer to reseat the bus connector that connected the video to the main board. Imagine having to do something similar to a computer or a video game system today. We expect them to work and if they stop, as often as not, many people will throw it out and buy another one. The speed of the printer has to be measured in minutes, not hours. The variety of materials and the characteristics of those materials needs to be sufficiently broad. This would include things like metals, ceramics, wood-like, teflon, rubber, etc. Did you know some people are already experimenting with printable food using chocolate and sugars and other ingredients? The food synthesizer of the original Star Trek doesn’t seem so far away now. The tools to make or re-mix a new thing need to be easy to use. Current tools and software require a great deal of patience and knowledge before you can be effective. The technology will probably be paired with a build-in low-cost scanner. Back when I was making the case to my Dad to try and justify spending the then prodigious sum of $300 for my first computer since I didn’t have that money, he asked me a very rational question: “What are you going to do with this?” I didn’t have a great answer then, because I hadn’t had a computer before, but I probably talked about learning how to program and writing games, both of which I would later do for a ridiculous number of hours. That first computer undoubtedly put me firmly down a path which has paid off that investment many, many times over. Recently when I was talking to my wife about 3D printers, she asked a similar question: “What are you doing to do with it?” There was similar hand waving and attempts at justification, but at the end of the day, I don’t need a 3d printer any more than I needed that first personal computer. But now, as then, I’m convinced that this technology is on a similar cusp of enabling amazing things and amazing times and, at the end of the day, I want to experience that joy of learning and joy of discovery much as I did 35 years ago with my first computer. So, what am I going to do? I don’t know, but I’m pretty sure it’s going to be cool!